TPU found details about Chiron, an upcoming high-capacity solid state disk from OCZ that targets datacenters. The disk has a 3.5" form factor, uses a 6Gbps interface and consists of multiple SSD sub-units, each controlled by an OCZ/Indilinx Everest chip. 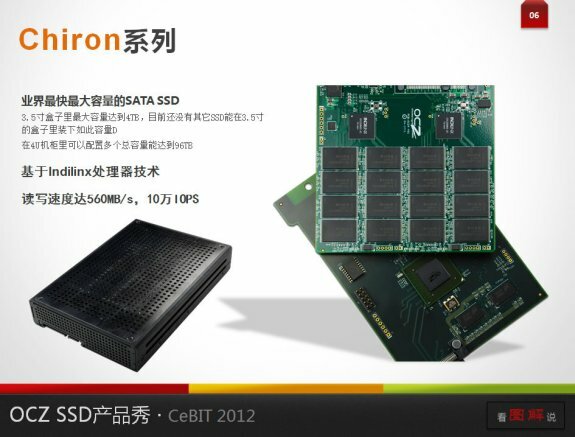 Built in the 3.5-inch form-factor with a 6 Gb/s serial interface (not sure if it's SAS or SATA), the Chiron is a complex SSD, which consists of multiple SSD sub-units, each driven by OCZ-Indilinx Everest controllers, maintained in an abstract RAID configuration by a localized RAID controller. The drive is available in capacities as high as 4 TB, and provides sequential performance as high as 560 MB/s, with 4K access performance of 100,000 IOPS.